Independently Yours Medical Supplies is located in Louisville, Colorado on the corner of South Boulder Rd. and CO-42 next to Union Jack Liquors. Our full retail medical supply store has a large inventory of rental medical supplies for daily, weekly, and monthly rentals. Whether you are looking for crutches, wheelchairs, knee scooters, mobility scooters, hospital beds, walkers, lift chair, or patient lift rentals, we have it all. Renting medical equipment is ideal for when the use is short term and temporary, or renting is significantly lower than the cost to purchase the item. Visit our store in Louisville, Colorado to pick up your rental or call to reserve one today. Independently Yours Medical Supplies located in Louisville, Colorado offers knee scooters (knee walker) rentals for daily, weekly, and monthly rates. Knee Scooters are ideal for people with foot, ankle or lower leg injury and need to keep weight off of the foot. We carry standard and heavy duty knee walkers that fit people of heights from 4’8″ – 6’4″, as our knee walkers are height adjustable. The knee scooter rentals fold up, have dual locking hand breaks, a front basket, rugged 8 inch wheels and a contoured cut out rubber knee pad. Our Nova TK12 knee walker features one of the best turning radius for knee scooters. If you live in or near Boulder, Louisville, Broomfield, Westminster, Superior, Arvada, Longmont, Lafayette, Thornton, Golden, Lakewood, or Evergreen then give us a call to reserve your knee scooter rental, or stop by to test one out. Available for same day rental and pickup. Independently Yours Medical Supplies in Louisville, Colorado now carries two types of All Terrain Knee Scooters, allowing you the mobility and independence you deserve to travel on all types of terrain including grass, dirt, concrete, hills, and more. Featuring large rugged wheels, a sturdy steel frame, and a thick cushioned knee pad for maximum comfort. All Terrain KneeRover Knee Walker is the most versatile and advanced steerable knee scooter in the industry – establishing a new level of durability and freedom of mobility for individuals who cannot bear weight on their foot or ankle, yet want to remain active. -Ideal for individuals recovering from injury or surgery to the foot, ankle or lower leg as well as below the knee amputees. The All Terrain KneeRover® is an excellent alternative to crutches and offers the most versatility among knee walkers. 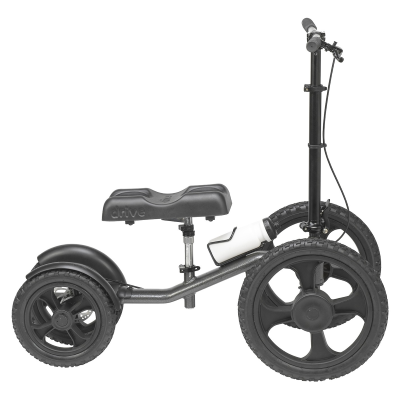 -Indoor – Outdoor All Terrain knee scooter features 12 inch pneumatic tires – perfect for navigating your home, work, and any terrain with ease – including grass, gravel, dirt and gaps in sidewalks. This is simply not possible with most knee scooters available today. -Fully adjustable knee platform and handle bars with easy folding mechanism for simple transport and storage of rolling knee walker. Heavy duty double bar construction offers unprecedented strength and stability for a knee scooter. All Terrain KneeRover® knee walker offers a 350 lb weight capacity and is recommended for individuals with heights 5’6″ – 6’5″. Independently Yours Medical Supplies in Louisville, Colorado has a large inventory of wheelchair rentals to help service the Boulder, Broomfield, Louisville, Wesminster, Longmont, Arvada and surrounding citiees. We have wheelchair rentals with 16″, 18″, 20″, and 22″ seat widths to help accommodate all people and their needs. Our wheelchair rentals include either standard footrests, or elevating footrests, desk length armrests, locking wheels, and easily fold up to make transporting easy. You can walk in and rent a wheelchair at our Louisville location, or you can call in advance to reserve your wheelchair rental to ensure that we have one available for your specific days or event. Independently Yours Medical Supplies in Louisville, Colorado rents and sells fully electric hospital beds. Our hospital bed rentals include free delivery, set up and pick up. The fully electric bed has a head section that raises up to a 90 degree angle, as well as a foot section that raises at the knees independently independently. One of the other main benefits of a hospital bed rental is the ability to raise and lower the entire height of the bed frame to make getting in and out of bed much easier for both the user and care giver. With illness, injury, and old age, getting to the second floor of homes where the bedroom is or being able to get in and out of the bed can be an issue. Our hospital beds are portable, easy to move and set up, and include a therapeutic support surface mattress to help prevent pressure sore build ups. We have a fully electric hospital bed and mattress set up on display at our store in Louisville, Colorado where you can test out the high quality mattress, demonstrate all the functions of the bed and remote control and make sure it is everything that you are looking for. We deliver hospital beds to the following but not limited to: Louisville, Boulder, Broomfield, Arvada, Westminster, Brighton, Longmont, Superior, Northglenn, Thornton, Golden, Lakewood, Evergreen, and Denver, Colorado. Call us today for more information or to schedule your hospital bed rental reservation. We can normally have your rental delivered to you the following day (excluding weekends) but more advanced noticed is preferred. Includes delivery, set up, pick up and therapeutic support surface mattress and hand rails if needed. Independently Yours Medical Supplies rents electric recliners and lift chairs. We have a large inventory of rental lift chairs that allow us to deliver to you within a days notice. The Golden Technologies Monarch Lift Chair is the model of our rental chairs, and features a vinyl fabric. 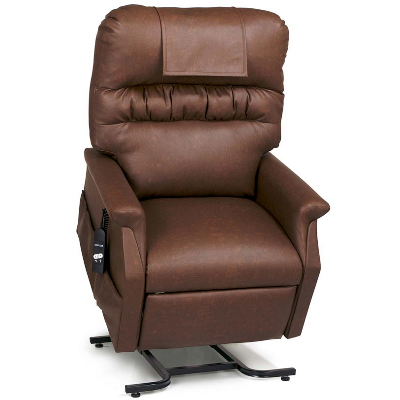 The chair reclines, lifts you up and brings you to a seated position with just the touch of a button. Lift chairs are perfect for people recovering from surgery and need help getting in and out of a chair, or need to keep their feet elevated. Golden lift chairs are extremely comfortable and built to have people spend hours a day in them, making them a substitute for a bed if needed. Visit our Louisville, Colorado medical supply showroom to test out the rental lift chair before renting or try one of our other 5 signature Golden Technologies lift chair models. Free delivery, setup and pick up is included in the rental for: Louisville, Boulder, Broomfield, Westminster, Arvada, Brighton, Longmont, Lafayette, Lakewood, Golden, Denver, Northglenn, Superior, Wheatridge, and Aurora. Each additional week after 1 month: $50. Includes delivery, setup, and pickup. Independently Yours Medical Supplies in Louisville, Colorado rents power mobility scooters for all occassions. The power mobility scooters for rental easily disassemble into 4 compact parts to make transporting easy and convenient. Our rental mobility scooters are made by Golden Technologies, and industry leader. The Golden Buzzaround XL mobility scooter has a driving radius of 8 miles on a full charge, with a top speed of 4 mph. We rent both 3 and 4 wheelers. Perfect for walking the trails, bike paths, senior living facilities, houses, events and farmers markets in Boulder, or any other open space to make getting around easy, quick, and pain free. Power Chair Rentals are available at Independently Yours Medical Supplies located in Louisville, CO for daily, weekly, and monthly rentals. These compact electric wheelchairs allow you to travel and get around in style and independently. Whether you are traveling, injured, or ill, our Golden Technologies LiteRider Power Chair will be sure to help you get around. 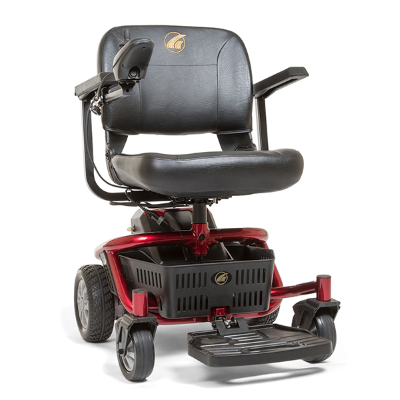 With a driving range of 12 miles on a full charge, 4 mph max speed and a tight turning radius, this power chair rental is great for in home use and outdoors. Stop by our store in Louisville, Colorado to test drive a power chair and reserve your rental. Power Chair and electric wheelchair rentals for Boulder, Louisville, Superior, Broomfield, Westminster, Longmont, Arvada, Lafayette, Lakewood, Littleton, Denver, Aurora, Brighton, Thornton, Evergreen and those visiting from out of town. Transport Chair Rentals are perfect helping transport people around without lugging around a bulky, heavy wheelchair. 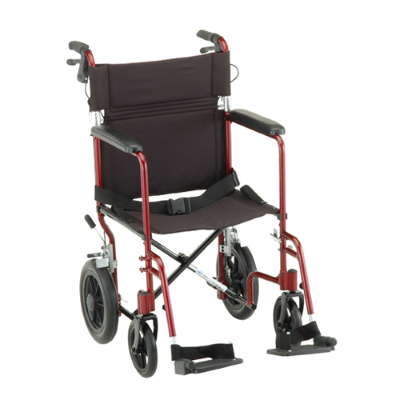 Transport chairs are significantly lighter, around 25 lbs total, do not have large wheels on the side, and have the option for locking hand brakes. The person who is sitting down cannot wheel themselves, and requires someone to wheel them around. Our transport chair rentals are available for at daily, weekly, and monthly rental rates and can be picked up at our Louisville, Colorado store location. Transport chair rentals can be reserved in advance or picked up the day of (if available). Independently Yours Medical Supplies rents two types of Patient Lifts: Hoyer Lifts and Sit to Stand Lifts. Both lifts help caregivers lift people out of the chair, bed, couch or toilet without causing harm to themselves or the patient. Our hoyer lift and sit to stand rentals include free delivery and pick up, but the sling you must purchase and get to keep when you are done. You can view and receive a demonstration of one of the patient lifts at our Louisville, Colorado location. Does not include a rental sling. Sling must be purchased, or have your own. Independently Yours Medical Supplies in Louisville, Colorado rents and sells Ice Therapy Machines (Cold Therapy Machines) at daily, weekly, and monthly rates. We carry the IceMan Classic Cold Therapy Unit (Ice Machine) by Don Joy that helps reduce pain and swelling. The IceMan Classic Ice Machine provides extended cold therapy as directed by a medical professional. Using this cold therapy unit patented semi-closed loop recirculation system, IceMan delivers consistent temperatures in a pre-set configuration, Ice Machines provide better results than ice alone by penetrating deeper and lasting longer than ice packs. Pads are sold separately ($50). You keep them afterwords. Rent crutches by the day, week or month at Independently Yours Medical Supplies in Louisville, Colorado on South Boulder Road. We carry crutches to fit user heights of 4’2″ – 6’6″. We have four different height ranges of crutches that are adjustable to fit each persons height. Visit our store to pick up your rentals and have them fitted to your specific height.